This weekend I attended the Milwaukee Muskie Expo at State Fair Park. It’s a fun way to stay connected to muskie fishing during the winter months when we can’t fish for them (The muskie season in WI goes from May through December). Basically, there are a lot of lure manufacturers, rod/reel makers, boat dealers, taxidermists, and fishing guides that set up in booths to try and get you to consider their products. My favorite to look at are the Lax replicas and Fittante replicas – it’s great to see some big fish that other fisherman have caught. I also keep my eye out for new and exciting lures – muskie often get used to seeing the same things over and over, so it can help to give them something new. This year I picked out a new Bondy Bait, the Royal Orba. I’ve never thought Bondy Baits looked that great, but I know they’ve gotten results. This new one has a nice tail and trails double blades, so it should be something the fish are not used to seeing. The only sad thing is that I’ve got to wait until May to test it out. Finding a guide can be a challenging experience. Most guides cost $200 – $400 a day, so there is pressure to find a good one who really knows his stuff. Word of mouth is the main way to find a reliable guide, but if you’re going to an area where you don’t know too many people, like on a vacation in another part of the state or country, you’re going to have to find another reference. It’d be helpful if we had an internet database where people could rate the guides based on how the trip went. If such a database existed, I’d use Oracle’s FIRST and LAST functions to find the right guide. This is the standard way to do this in SQL Server 2008 R2 (the later versions have a version of the FIRST and LAST functions). 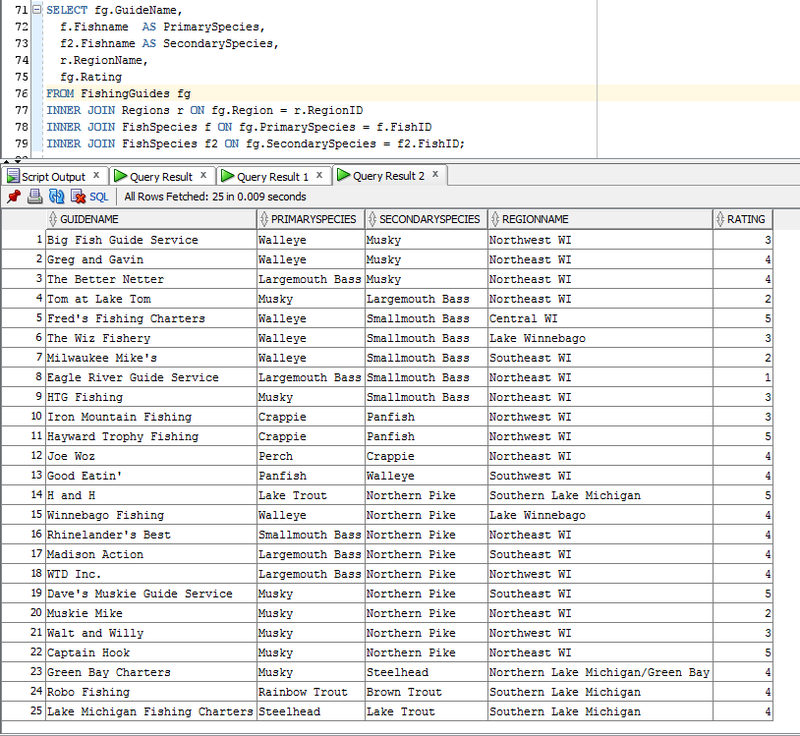 This example was pretty simple, so lets look at a complex example using fishing guides as an example data set. In this example each guide will be assigned to a certain region of Wisconsin, and will specialize in two fish, a primary and a secondary. They will also be rated based on past user experience. These guide names are all made up and any names that happen to really exist are coincidental. Now I can see if I want to go for musky and northern, I can get a five star guide in Captain Hook. However, if I’d rather go for musky and walleye, I can book Greg and Gavin and go with a four star guide instead. I hope this has helped explain how to use the LAST and FIRST functions available in Oracle. As I stated, SQL Server has similar functions available starting in 2012.